If you loved the Chicken and Vegetable Egg Rolls be sure to try this even easier version, Baked Sausage and Teriyaki Egg Rolls! This recipe makes another 60 egg rolls for your family. One 52-ounce bag of Birdseye “teriyaki stirfry” mix. This mix also comes with two packs of teriyaki sauce. 1/2 a head of shredded cabbage. Dump 52-ounce bag of teriyaki stirfry, 1/2 head of shredded cabbage, and two included packs of teriyaki sauce in a large pot or dutch oven. Cook until softened through. Mix in 3 pounds of crumbled and pre-cooked sausage. Place 2 tablespoons of sausage teriyaki stirfry mix into an egg roll wrapper. Wrap and place on baking sheet. Bake at 415 for 15 to 20 minutes. 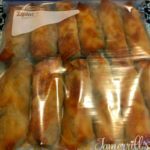 Fill gallon freezer bag with baked egg rolls. Mark date on freezer bag. To reheat just place the desired amount of frozen egg rolls on a microwave-safe plate and warm until heated. Or place frozen egg rolls on baking pan and place in oven at 350 degrees for 5-7 minutes or until heated through.